I have 2 ios projects, one that was started before xcode5 came out. Another I started today (created it in xcode). The former has options to run on my phone, as well as 4 simulators. The latter has options to run on 2 simulators. How can I tell Appcode to run it on my phone? "Edit Configurations" does not show anything related to this. 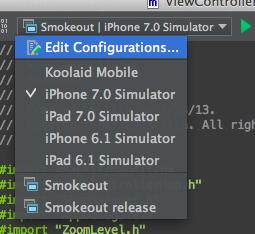 Also, xcode shows me simulators that are defined by their size, how do I choose these in Appcode? AppCode offers only suitable simulators for the selected target, basing on the iOS Deployment Target build setting and target architecture. I'm seeing this too. AppCode 2.1.2 doesn't seem to be able to run on the device if you have 64-bit enabled in your target architectures. Your new Xcode project likely has build settings for "Standard architectures (including 64-bit) (armv7, armv7s, arm64)". 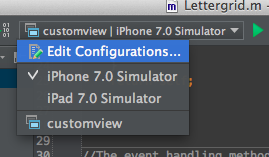 When I toggle that back to "Standard architectures (armv7, armv7s)", AppCode can run it on the device. AppCode 2.1.x currently doesn't support Xcode 5. We are preparing AppCode 2.5 release that will be available in a week. You can try the latest EAP build here.